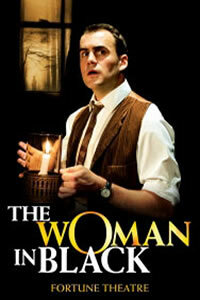 Why is 'The 'Woman in Black' the best ever GCSE Drama play? There are aficionados who clock up performances of Les Mis. For a show so timeless in its themes, that’s perhaps understandable. And then there’s The Woman in Black, a play I’ve seen (by my best guess) at least a dozen times – more than I’ve seen Hamlet and King Lear combined. School groups and parties of tourists flock en mass. As a teacher, I reckon I’ve taken at least six hundred students to see the play – and few leave disappointed. It’s the perfect production for students of GCSE Drama – almost every idea mentioned in the specification is neatly demonstrated on stage – and its reputation seems to be spread largely by word of mouth, arguably the highest form of praise. For the uninitiated, however, it’s hard not to approach the play without a sense of cynicism, especially for seasoned theatre-goers whose ability to suspend disbelief is sorely diminished. But The Woman in Black’s reputation as the most spine chilling of theatrical events justifiably precedes it; trying to pin down what exactly is the secret to its success is pretty elusive. Undoubtedly, the venue is a major contributor to the production’s sense of fear. In the shadow of the illustrious Theatre Royal in Drury Lane, picture the tiniest and grottiest of London theatres, the Fortune, home since 1989 to the West End transfer of the play. Despite some efforts to smarten the place up a few years ago, the Gents still reek and the decor needs more than a casual lick of paint. The seats squeak far too often (and that is a genuine gripe) and one is disappointed that smoking is no longer allowed in the bar – it’s the one thing that would add a finishing, atmospheric touch of a bygone age. It’s exactly the sort of venue which a play actually set in a decrepit old theatre requires. As an added bonus, even from the loftiest of Upper Circle seats, the actors are scarcely more than a stone’s throw away, though if money is no object, the scariest experience is to be had in the stalls. Over the years, some actors have been slightly stronger in the two main roles, but don’t worry about the lack of big names in the cast: The Woman in Black’s power certainly stems in part from the sheer quality of the writing, both Susan Hill’s original novel and the late Stephen Mallatratt’s dramatisation. Hill’s novel is, like much of her writing, deceptively simple: an accessible ghost story is marked by a style rich in literary allusion, drawing the reader into a Dickensian world of smogs, misty marshes and hidden secrets – but this is no Christmas card of a ghost story. Beneath it all is a disturbing tragedy of secrets and lies, and underneath that a sense of genuine evil. Hill, a Christian, has admitted to not believing in ghosts ‘as such’ but has spoken of her own understanding of ‘the knotty problem’ of evil, admitting, ‘I think there are some people, not many, who have… the devil in them’. Undeniably, there’s something incredibly dark and foreboding about her story. Mallatratt’s adaptation captures the essence of Hill’s writing, neatly adding a frame which all the time draws attention to the artificial nature of the play, subtly disarming the audience. Hill herself pronounced Mallatratt a ‘genius’ and his adaptation is amongst the finest I’ve ever seen of a novel. Arthur Kipps has a story to tell, and bizarrely for a play in which fear is the overriding emotion, the story begins comically. In this adaptation, Kipps has hired the assistance of a nameless actor, whose job it will be to tutor him through the process of telling his story. Kipps is a terrible actor, and he is only reluctantly persuaded to present the story through the medium of drama. The nameless actor suggests that he plays the younger Kipps, with Kipps himself playing the other roles. It’s a neat device, enabling just two actors to play a range of characters convincingly. Atmosphere is never missing. Gradually both Kipps and the audience are introduced to the means by which the play will be told, and which place the story somewhere in the early years of the twentieth century: recorded sound, lights, a simple set of a wicker trunk, a handful of wooden chairs and a few costumes, never amounting to more than a change of coat or jacket. Before long, the action has truly begun: from London, Kipps travels by train, and the first moment of fear literally erupts as the train unexpectedly rushes through a tunnel, and the story switches to a remote market town and the mysterious Eel Marsh House, which lies out across a causeway, prone to ‘frets’, wild and unexpected mists which suddenly descend. It is here that Robin Herford’s role as director comes to the fore. Time and time again, the actors deliver. Characters are evocatively developed through gesture and accent. Visually, everything is perfectly done: the dark green, almost black, gauzes which hang at the rear of the stage; the sombre suits of the actors; the deeply stained wooden furniture; a few simple props: a torch, bundles of old letters and a knapsack. The set is remarkably simple, and the lighting rarely more elaborate than a few gobos. A gothic funeral, rich in the language of the prayer book, is distinctly unsettling, while the sound of howling wind is perfectly judged. Even at the interval, the audience are beginning to feel something distinctly uneasy. Few are actually petrified – though perhaps that is another of the show’s tricks: the best directors know that it’s a terrific second half which an audience will remember. By the end, however, even cynics generally emerge shaken to the core, trying to dismiss the experience and mumbling something about a ‘ridiculous door’. it’s hard, however, to quantify what exactly scared the most: an actor attempting to light a candle; a shadow; a moment of pitch darkness; the frantic narration of events, recalled by the nameless actor; the almost cliched sound of heartbeats or the moment in a child’s nursery when…. As for me, do I still feel a sense of fear after all these times? I’m often asked this by pupils. It’s hard to explain exactly. Fear seems to travel through an audience: look around early on and there are audience members who are starting to feel at the very least uneasy – faces are sometimes buried in hands, involuntary groans and screams and nervous laughter. Despite knowing everything that’s coming, I occasionally have that gnawing feeling in the stomach which gripped me the first time. Is it just the memory of how awful I felt or is it the power of the play itself, still working away, or even something darker? It would probably require a psychologist to discern what exactly is going on. For teachers, sitting through the same production more than once is an occasional occupational hazard. I’ve seen the National Theatre’s touring version of An Inspector Calls a couple of times – by the third outing, I was more than a little restless, and it’s probably why I now refer to the play as An Inspector Bores. But The Woman in Black is quite different. Could I sit through another twelve nights of it? Possibly not, but any play which has lasted this long must have more than a little going for it.